Do I REALLY have to send hand-written thank you notes? Many people think that hand-written thank you notes are a long-forgotten tradition. In the age of Twitter, Facebook, text messages and all the rest, we rarely sit down and craft hand-written notes and letters anymore. Your wedding is not the time to blow off the hand-written thank you note, though. Each guest will put time, a lot of thought, and money into the gift they give you. It's important to take the time to thank them appropriately, not only for the gift but for attending the event, as well! What do I say in my wedding thank you note? Before we get to what you should never say, let's look quickly at what you should say. If you follow these simple guidelines, writing your thank you notes will be easy. You don't have to write a novel, but you want to make sure your thank you notes are personal and sincere. Say "thank you for ..." (fill in the blank with the gift). Start every note this way. Be specific about how you plan to use the gift. For example, if you received something for the kitchen, you might say, "I can't wait to use it to make our favorite lasagna!" Let them know how nice it was to see them at the wedding. If they couldn't make the wedding and they just sent a gift, let them know they were missed. Close with a reference to a future visit or get together. Never imply that the gift was less than you were expecting. Never let them know if you received a duplicate of the gift from someone else. Never let them know that you are returning or exchanging the gift. Remember that thank you notes aren't for gifts alone. 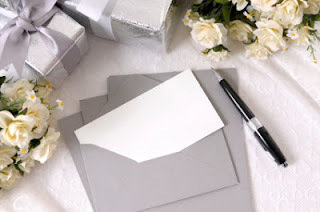 Be sure to send thank you notes to your bridal party and any other person who helped you with your wedding day. Your wedding vendors appreciate thank you notes, too ... especially if you have someone who really goes above an beyond for you! For a great selection of affordable wedding thank you notes, check out our Carlson Craft dealer site! You can personalize and design your thank you notes (and your invitations) online ... it's great!